It’s true that Instagram is still the fastest growing social media network. In the last year, it went from 600 million to 800 million active users, which gives your social media marketing strategy a lot of potential. As with all platforms that receive increased attention, the competition for space becomes challenging. Other brands have noticed the marketing potential and are filling up Instagram feeds with their ads and posts. Have you fully embraced Instagram this year? Perhaps you started but somewhere along the way you fell off the wagon. Instagram isn’t going anywhere, so it’s time to get back on the social media marketing horse. Let’s take a look at some of the ways you can make the most of your opportunities on this powerhouse platform. From the beginning, Instagram has been big on hashtags. They remain an effective way to expand your reach on the platform. Did you know that you can add up to 30 hashtags per post? That’s a lot. When done correctly, you’ll start to show up in more people’s feeds because Instagram allows users to follow specific hashtags. It means that you have a whole other way to reach Instagram users! Targeted hashtags put you in front of relevant people, which means it’s not a shot in the dark. You’ll have a much easier time snagging new followers and converting them when you practice this in each post. You can also use local hashtags to reach users in your direct area. If you’re in Cedar Rapids, Iowa City, or Marion, search for local hashtags that are circulating and add them to your posts. This aspect of Instagram is a bit more complex, but the numbers can be swayed in your favor. Over time, interaction through direct messages has changed. A lot of social media platforms have added and adjusted their messaging programs, and Instagram is no exception. Direct messaging is still seen as a method of personal connection, so brands aren’t always welcome to users’ inboxes. It’s likely that users are connecting with their friends through DM but it using the feature is something to keep in mind. The integration of links within messages gives you a new way to meet a user’s needs. While Instagram has greatly changed since it first launched, it’s important to remember that it’s still a visual platform. There are semi-complicated workarounds for the desktop, but Instagram is primarily for photo sharing among mobile users. As a small business, your social media marketing strategy needs to represent your brand consistently. If you’re just starting out, it may take some time to determine what your brand looks like, but once you do, keep it consistent and post it on Instagram. Keep in mind the composition of your images when posting to Instagram. In order to stand out, think about the colors, filters, images, and overlays you use. The more you create a clear, consistent style, the easier it will be for users to identify you. Social media marketing doesn’t have to be a thorn in your side. In fact, it can be quite fun! 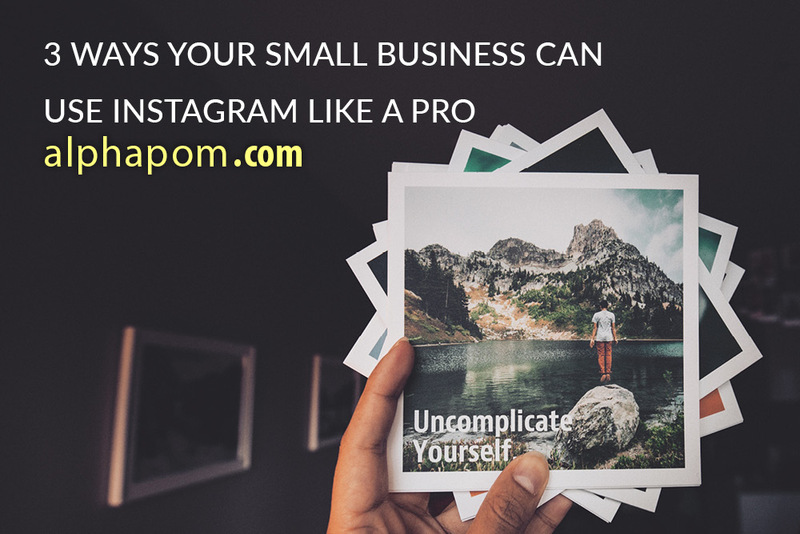 If you’re struggling to expand your Instagram presence or make the best of any social media platform, speak to the team at Alphapom today. We specialize in helping small businesses like you expand their online presence through SEO, video marketing, blogging, and social media management.